A rendering of the upcoming Giant Heirloom Market, currently under construction in Philadelphia. Giant Food Stores is readying the launch of a new, smaller store format geared for urban markets. Called Giant Heirloom Market, the first store is now under construction in the Graduate Hospital neighborhood of Philadelphia. Sized at about 9,500 square feet, the location will provide fresh, natural, seasonal and flavor-focused foods along with daily staples. Carlisle, Pa.-based Giant said it plans several Giant Heirloom Markets for Philadelphia. Although the supermarket chain has had a store on Grant Avenue in Philadelphia since 2011, the initial Giant Heirloom Market will be the retailer’s first downtown location, at 2303 Bainbridge St. 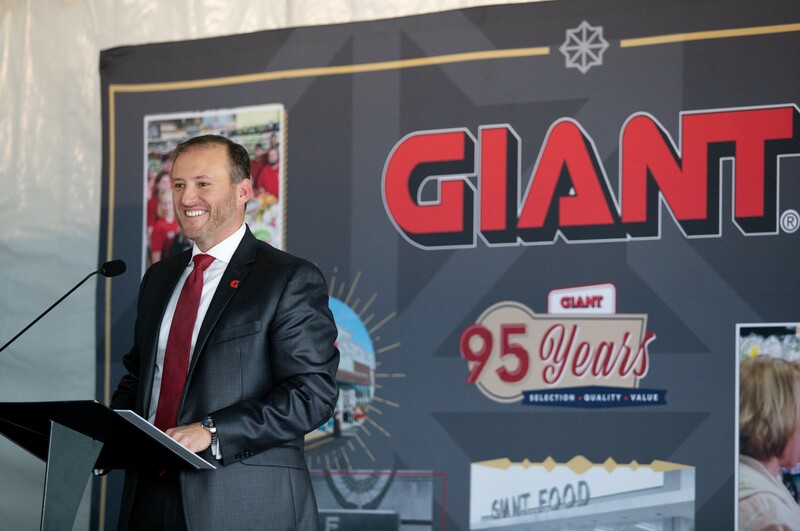 Giant President Nicholas Bertram (above) unveiled the new format Thursday at the grocery chain’s 95th anniversary event in Philadelphia’s Dilworth Park. Participants included Mayor Jim Kenney, local elected officials, community leaders and Giant associates. According to Bertram, Giant Heirloom Market will harken back to the retailer’s original Giant Market concept by meeting the needs of the neighborhoods it serves in an innovative, contemporary retail experience. For example, the concept will include a produce chef who will prepare vegetables and fruit on demand, as well as local artisanal breads and a broad selection of plant-based foods. The store also is intended to encourage exploration and creativity in the kitchen via samplings and demonstrations, Giant said. At the same time, Giant Heirloom Market will sport a modern store design and layout, including tech features to support “endless aisles,” Giant said. Associates will guide customers to in-store iPads to order online via Peapod pickup or delivery if they want something not carried in-store. The first Giant Heirloom Market store is expected to create about 60 new jobs in Philadelphia when it opens. Pennsylvania has been an expansion area for Giant. In June, the chain unveiled a $22 million investment plan for Lancaster County that includes a 38,000-square-foot e-commerce hub at its former North Reservoir Street location, four store remodels, a price-cut program and a new fuel station at its Lititz store. The e-commerce hub will serve as a grocery delivery center and curbside pickup site. The Lancaster investment builds on a $70 million plan, announced in April, to expand Giant’s store network across Pennsylvania. The initiative includes six new stores, two store remodels and four new fuel stations over the next two years. Overall, Giant Food Stores operates more than 170 supermarkets under the Giant and Martin’s banners in Pennsylvania, Maryland, Virginia and West Virginia.